The Cocker Spaniel Lab Mix is the result of cross-breeding an American Cocker Spaniel with a Labrador Retriever. 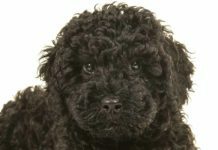 In this article, we first discuss some general concerns about first generation cross breeds before diving into some of the specifics about Cocker Spaniel Labs. First generation mixes are also commonly referred to as ‘designer dogs’—the intentional mixing of two purebred pups. There is a lot of controversy surrounding designer dogs, with strong supporters both for and against them. One thing to note about designer dogs is that it is more difficult to predict the traits of offspring compared to purebreds. Although, the more similarities there are between the parent breeds, the easier it is to predict a puppy’s traits. A common belief is that designer dogs are healthier than purebreds. Is this really the case? The health and welfare of your puppy are going to be your foremost concern, whether your dog is a pure breed, designer dog, or mutt. While purebreds tend to have reduced vigor compared to mixed breed dogs—resulting in shorter life spans and less virility—this doesn’t necessarily mean more health problems. Moreover, the theory that purebred dogs are healthier is impossible to prove by comparing the entire populations of purebreds versus mutts, however, research has successfully demonstrated that inbreeding (how you get purebreds) results in a smaller genetic pool. When you shrink the gene pool, you increase the likelihood of passing on genetic traits that may cause health problems. And since some purebreds are not as common or popular as others, they will have a smaller gene pool and may be more likely to have health problems. However, when comparing an individual purebred puppy to a mixed breed puppy, either dog could end up being the healthier one. The overall health of your pooch will be not be based solely on the parents but will also depend on other factors like on genetics or a simple ‘luck of the draw’. So what are some common traits of the first generation Cocker Spaniel Labrador mix and what should you know? The Cocker Spaniel and the Labrador are energetic, highly active dogs that tend to be friendly and relatively easy to train. As sporting dogs, they are also known for excellent instincts in the woods and in water. However their roles were historically a little different. The Labrador Retriever has been bred to pick up game and bring it back to their owner. This involves working co-operatively, following hand, whistle and verbal cues. They are traditionally worked in a variety of terrains and are reliable working partners, with a real love of, well, just about everyone! The American Cocker is a hunting dog. Although he has some retrieving uses out in the field, his main job is to flush game. He does this by diving fearlessly into the bracken, thorns and gorse to find rabbits, birds and a variety of other wildlife. He has also needed to work co-operatively, changing direction on cue and fetching when required. But to do this hunting, an increased enthusiasm of finding prey has been bred into these little dogs. This can make it tricky for some novice owners, who find they are ignored entirely on walks in favor of the wildlife. Labrador Retrievers have a reputation for being more outgoing and social, and definitely, love to play. However, both breeds are capable of speed and endurance and have a calm, stable temperament. 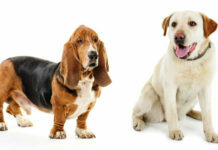 It is perhaps not surprising then that two of America’s most popular dog breeds were selected as a mix. Also, given the broad similarities between the Lab and the Spaniel, the qualities to be expected in a Cocker Spaniel Lab mix puppy are more easily predicted than other mixes. 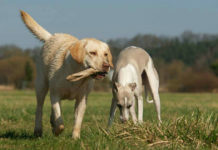 However, Labs are less likely to have the high prey drive of the Cocker, so you need to be prepared for this as a possibility in your pup’s personality. 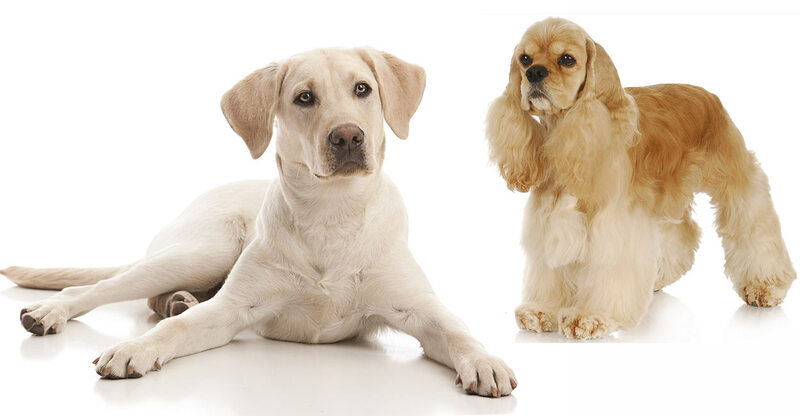 Both the Cocker Spaniel and Labrador are considered medium sized dogs, however, at different ends of the spectrum. There is definitely a noticeable size difference between the two breeds. Male Labradors can weigh anywhere between 65 to 80 pounds, with a height of 22.5 to 24.5 inches. Females are typically smaller, weighing 55 to 70 pounds and are 21.5 to 23.5 inches tall. The Cocker Spaniel is technically still within the medium range, but is, in fact, the smallest sporting dog in this AKC group. Male Cocker Spaniels have heights ranging from 14.5-15.5 inches and weigh 25 to 30 pounds, and females are 13.5-14.5 inches tall and 20-25 pounds. The Labrador Cocker Spaniel mix could end up anywhere within this range. This is an important point to be aware of there is a considerable difference between a dog that is 20 pounds and one that is 70 pounds! The American Cocker Spaniel has two coats: a shorter undercoat, and a longer, silkier outer coat, which can be either straight or wavy. Spaniels have longer hair—termed feathering—around the ears, belly, chest, and legs. The amount and length of fur on a Cocker Spaniel requires regular grooming, to avoid tangling and matting. Labradors also have two coats, although their top coat is much coarser, sometimes called a Guard coat, to help repel water and protect the skin. While grooming is always important, Labradors do not need bathing as often as some other breeds due to their shorter, sturdier coat. As a mixed breed, a Cocker Spaniel Lab mix could end up with either coat or something in between. Thus, grooming regimens may vary. What we do know for sure is that Labs are a high shedding breed, so you need to be prepared for the possibility of dealing with a whole lot of hair. Even with a Cocker Spaniel Lab mix! Both Labradors and Cocker Spaniels are known for their stable and balanced temperament as well as a friendly, loving nature. Both breeds are outgoing dogs that love to play and are relatively easy to train. However, the high hunting instincts of the Cocker mean that it’s more important with this breed or mix to start recall training straight away. And to potentially avoid walks with lots of rabbits or squirrels to distract them! 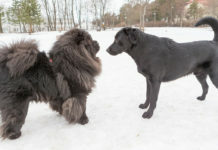 Since both of the parent breeds have very similar temperaments, this increases the likelihood that a Cockador dog will exhibit the same behavioral traits. Therefore, the Spanador temperament is generally stable, easy-going, and friendly. Spanador dogs are known for being loving towards people and eager to socialize with humans. However, it is still important to check the temperament of both parents, as well as the background and upbringing of the dog, and to ensure your pet is provided with proper socialization and training. Two common health conditions in both Labrador Retrievers and Cocker Spaniels are hip dysplasia and elbow dysplasia. Dysplasia occurs when a ball and socket joint does not form properly, which results in rubbing and grinding of the joint. Dysplasia causes pain and wear of the bone and can lead to a loss of mobility. 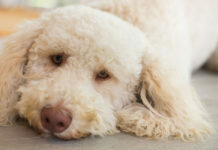 Symptoms of this disease tend to show up in puppies between 4 and 6 months old. Treatments carried before your dog reaches two years old tend to be more successful. Therefore, it’s important to be aware of this potential health issue so you can keep an eye out to catch it early. When buying a Cocker Lab mix, it’s important to ensure that both parents have good hip and elbow scores. This will reduce the risk of your puppy having dysplasia. Body weight is a significant factor associated with hip dysplasia. Labradors are known to struggle with obesity. According to one study, this was linked to Labrador Retrievers being more food obsessed than other breeds. Another study suggested obesity may actually be linked to a genetic trait. Either way, Labradors increased the likelihood of obesity combined with being prone to hip dysplasia, can result in serious medical complications if your Cockerdor inherits both of these traits. In addition, obesity is commonly associated with shorter lifespans, mobility issues, diabetes, heart disease, and cancer. Labradors and Cocker Spaniels share a similar history of eye problems. In particular, both breeds have a genetic predisposition to cataracts as well as Progressive Retinal Atrophy (PRA). Labrador and Cocker Spaniels also have in common an increased risk of immune-mediated hemolytic anemia (IMHA). 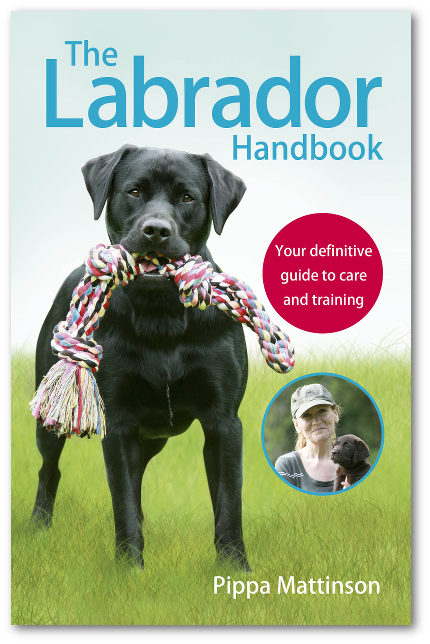 Other ailments specific to Labrador Retrievers are aortic stenosis, lumbosacral stenosis, and exercise-induced collapse. Cocker Spaniels have additional health concerns including epilepsy, seborrheic dermatitis, otitis externa, and cardiomyopathy. Your Cocker Spaniel Lab mix could inherit any of the above diseases. The best way to avoid them is to only pick a puppy from health tested parents. The minimum you should look for is hip and elbow tests in the Lab parent, along with a recent clear eye test and a clear PRA DNA test. The Cocker Spaniel parent should have a clear eye test, be PRA clear and ideally be hip scored too. Good breeders health test, and are happy to provide you with evidence of these tests too. 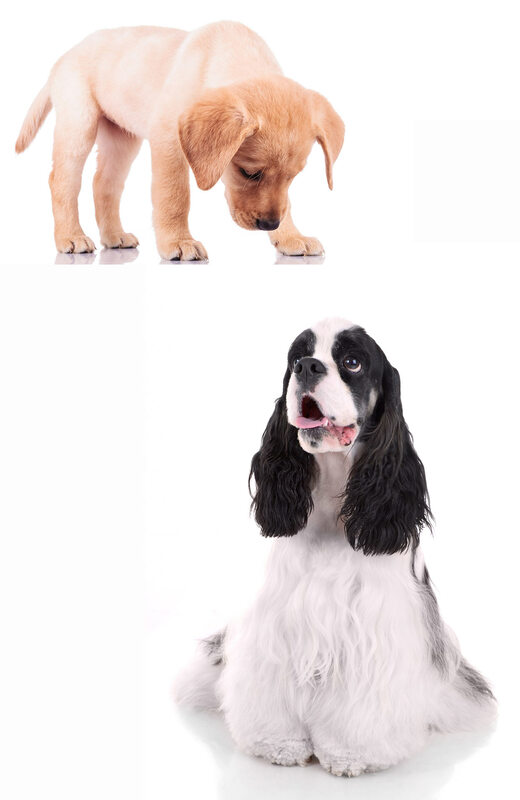 Both the Cocker Spaniel and the Labrador are high energy dogs, built for endurance. This means your Cocker Spaniel-Lab mix will likely have these traits. Both the parent breeds require regular, invigorating exercise, and by extension, a Cocker Spaniel-Lab mix will require regular physical activity. Since both of the parent breeds are in the Sports Group of dogs, they tend to excel at running, hunting, fetching, and swimming. Extended outdoor exercise will be preferred by your Cocker Lab mix. Labrador and Cocker Spaniel mixes are often eager to please, which should make training fairly easy, compared to more stubborn breeds. But the Cocker’s hunting instincts and Lab’s overly sociable personality can get in the way. Start using positive reinforcement training techniques from an early age, and put a real focus on getting a great recall. Labradors and Cocker Spaniels tend to be loving, social animals, and do well in homes with small children and other pets. Cocker Spaniel Labrador mix pups will enjoy prolonged periods of exercise outside. This means a home with a large open area or a family that will take their pup out to suitable natural environments is preferable. Both Labs and Cocker Spaniels are particularly well-known for craving human interaction and being friendly dogs. Labs are especially prone to becoming anxious and destructive if left unaccompanied for long periods of time. They and their crosses are therefore not suited to a home where the family is out for much of the day. 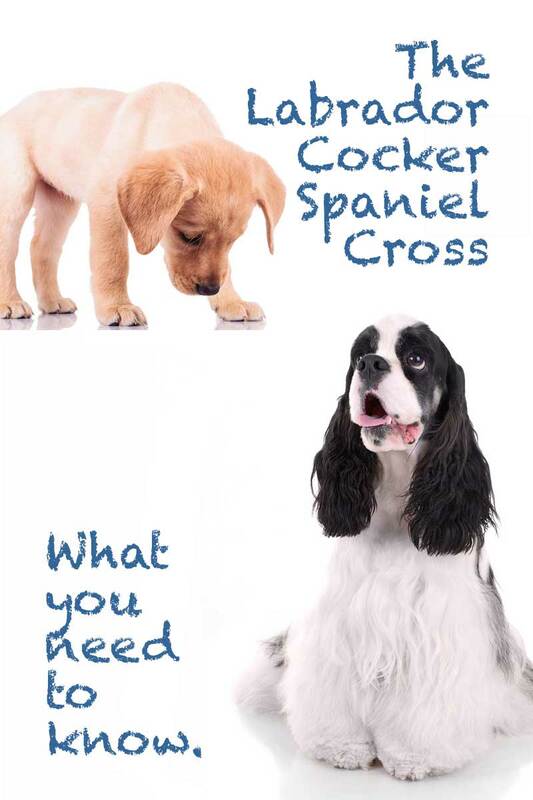 So if you are at home often and love company, you may be able to provide the ideal home for a Cocker Spaniel Lab! It’s best to ensure your puppy comes from a reputable breeder. Designer dog breeders of Labrador cross Cocker Spaniel puppies can be found online. Alternatively, you could contact animal sale and adoption websites. Pay attention to the living conditions your puppy is in, ask about both parents, and get as much information as you can to understand the background of your puppy. Even still, you could end up with a puppy that has the traits of either of the parent dog breed, or your dog could end up having a medical condition that was not seen in either parent. This is why health testing is so important, particularly for issues known to impact both parent breeds, such as hip and elbow dysplasia. This will help you to predict any potential issues or areas for concern. Is a Cocker Spaniel Lab Mix Right For You? 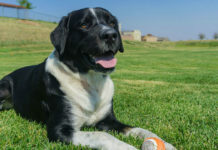 If you are home a lot, love long walks and visits to the park, and want a friendly outgoing dog that will give you plenty of attention, then a Cocker Spaniel Labrador mix may just be the dog for you. However, it’s impossible to guarantee your puppy’s temperament, which is why proper socialization and training are so important! Do you have a Cocker Spaniel-Lab mix? Please share your experiences in the comment section below. Beuchat, C. 2014 The myth of hybrid vigor in dogs… is a myth. The Institute of Canine Biology. Burgess K et al. 2000. Treatment of immune-mediated hemolytic anemia in dogs with cyclophosphamide. Journal of Veterinary Internal Medicine. Mukherjee M et al. 2017. Lumbosacral stenosis in Labrador retriever military working dogs – an exomic exploratory study. Canine Genetics and Epidemiology. Oberbauer, A et al. 2015. Ten inherited disorders in purebred dogs by functional breed groupings. Canine Genetics and Epidemiology. Patterson EE et al. 2008. A canine DNM1 mutation is highly associated with the syndrome of exercise-induced collapse. Nature Genetics. Raffan E et al. 2015. Development, factor structure and application of the dog obesity risk and appetite (DORA) questionnaire. PeerJ. Raffan E et al. 2016. A Deletion in the Canine POMC Gene Is Associated with Weight and Appetite in Obesity-Prone Labrador Retriever Dogs. Cell Metabolism. Smith et al. 2006. Lifelong diet restriction and radiographic evidence of osteoarthritis of the hip joint in dogs. Journal of the American Veterinary Medical Association. Anyone know any good cockador breeders? We have a lab cocker spaniel mix ( cockerdor ) called Angus. He is 6 months old and is adorable very much looks lab but with cocker ears. He is very affectionate easy to train. He is amazing with children. An absolute pleasure we wouldnt be with out him. He fitted in firmly with our family from day one.would very much recommend this breed. Wanting to know if a male lab gets a female cocker pregnant is it safe for the cocker to have the puppies naturally since the lab is much larger? We rescued a Spanador puppy three years ago and he’s a wonderful dog! He is social and LOVES everyone he meets. He also loves to play, other animals, and to be around people. He is a fantastic companion! He looks very much like a miniature lab at 30 pounds. With his small size and playful personality, most people think he is a puppy even though he is over three years old. We had what the adoption agency and every vet he went to called a labrador and cocker spaniel mix for many years. Because he was a rescue, we were never sure that this was his actual mix, but I couldn’t tell you what else could have possibly been in there. He was built like a short but thick lab and had the smile of the friendliest cocker spaniel. Pete was a great dog! Never met a stranger. Never showed any aggression towards anything. Got along with all types of animals. And was amazing with every child he ever came into contact with. This is absolutely a desirable mix. We loved ours until he left us just this past Christmas.